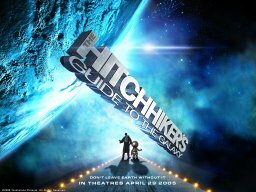 Finally after 10 years into making, The Hitchiker's Guide to the Galaxy was turned into a motion picture. The original book underwent alterations for its radio, tv adaptation, so has been true for its cinema adaptation. The story is altered to make into something more convincing for a movie, that people can relate to. This is yet to be released in India, i rented a cd, just because there wasnt any good movie out in the theatres. The start of the movie is good, with the dolphins and all, singing So long, thanks for all the fish. But i should say i am not that touched by the movie. It doesnt manage to maintain the absurdity, wit & humour of the book, which the book does at all times. But its a decent attempt, turning novels into motion pictures is always a daunting task unless they are written keeping the cinematic context in mind, like the Harry Potter books. The characters are one of the most important things as far H2G2 is concerned. So it is of utmost importance that the casting be proper. Well, i would say it fairly is, Arthur Dent, Tricia McMillan, Zaphod Beeblebrox are near perfect. But Ford Prefect fails to impress, he is bad at dialogue delivery. And Ford has some really cool things to state throughout the book. The depressed GPP ( Genuine Personality Prototype) robot, Marvin sounds and feels good in between shots. But is not as lovable as the one visualized from the book. His design is nice though. The Vogons look convincing. So does Slartibartfast. The special effects are innovative, the Vogon Constructor Fleets, the Heart of Gold ship are suitably made. The Magrathea, factory floor is amazing, spellbinding, just as described in the book. The best part is the way H2G2 the book is portrayed in the movie, with flash-like animation seen in the titles of Catch me if you can. In all a decent try, but no...it fails somewhere to impress...i dont know, how people who havent known about H2G2 would react to the movie...and theres a sequel hinted at the end...so lets see how it turns out. But Douglas' soul must be surely glad. I didnt get H2G2. How does Hitchikers Guide to the Galaxy become H2G2? H2G2G, HG2DG, mebbe? Its (H)itch(H)ikers' (G)uide to the (G)alaxy dude...now you see H2G2...and this nomenclature isnt my doing, its from the makers themselves.